Ada Harris married in 1891 Alfred Edward Day at St Saviors Church Lambeth. In August 1891 George Musgrove was a witness at the wedding of his sister in law Ada Harris at St Saviour's Church Camberwell. Ada Harris was the younger sister of George's wife Emily, and had lived with them when they lived at Benwell Road ten years before. Ada Harris married Alfred Edward Day. She was working at The Union Club in Trafalgar Square at the time and Alfred was employed as a waiter at a nearby club in Pall Mall. Alfred was born in 1867 and was the son of Samuel and Caroline Day. 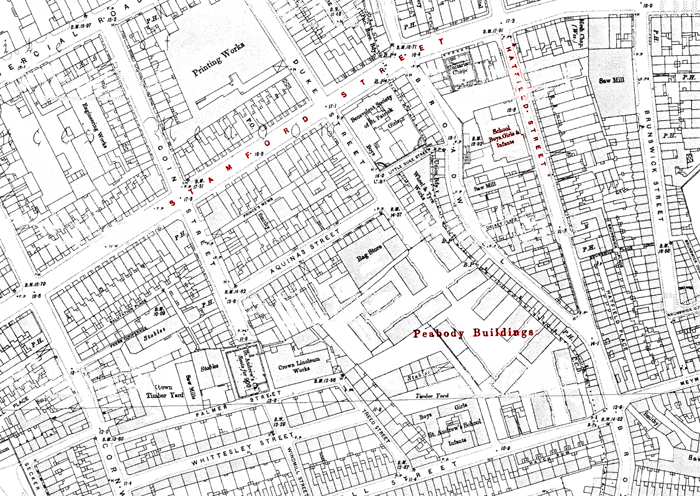 By 1894 Ada and Alfred had moved to Westmindter and were living on the Peabody Estate at 25F Peabody Buildings Orchard Street. 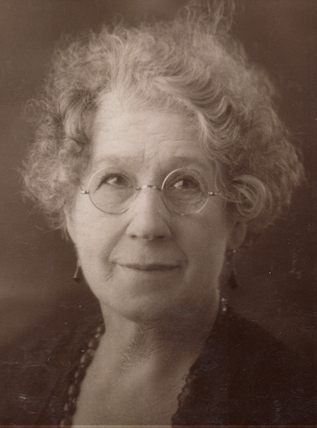 Their first child, Ethel Madaline Day was born in 1893, Alfred Edward Roy Day was born in 1894. Ada and Alfred's 3rd child Charles Lionel Banfield Day was born in 1896. They had now crossed the Thames into Lambeth and were living at 154 Stamford Street. The School Attendance Register extract below dates from 1900 and shows Roy (Alfred Edward Roy) and his brother Charles when they started at Hatfield Street School. The 1901 census below shows Ada and Alfred with their 3 children living in Peabody Buildings. Ada's husband Alfred died aged 37 early in 1903. At this time his son Charles transfered from Hatfield Street School to Addington Street School. This was due to the family moving to 114 York Road Lambeth. Ada's son Alfred Edward Roy Day was a casualty of the Great war and died in 1918. Alfred enlisted at Caxton Hall Westminster 15th Sept 1914 two months after the start of hostilities. 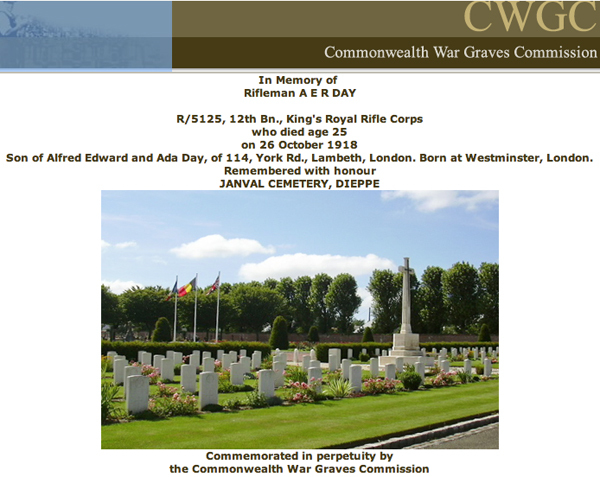 He fought throughout the war but as a result of contracting mustard gas he died on the 26th October 1918 just 16 days before the armistice was signed on the 11th November. Her son Charles Lionel Banfield Day saw service with the Royal Navy during this period. Lambert's younger sister Ada Day had moved in 1928 from rooms above 45 South Lambeth Road which she shared with her son Charles Lionel Banfield Day and her daughter Ethel Madeline Day. She moved to 22 Grosvenor Street Camberwell where they lived until her son married Florence May Pollard who was a next door neighbour. Ada Day after the war moved to 27 Grosvenor Park Camberwell with her daughter Ethel. They moved in 1956 to 22 Amery House Kinglake Street Walworth where Ada Day Died in December 1957. Her daughter Ethel having never married contined to live at Amery House until her own death in 1959. Her Brother Charles Lionel Banfield Day married in 1938 Florence May Pollard and they contined to live at her parents home at 23 Urlwin Street Camberwell until his death in 1975. His wife lived a further ten years until her death in 1985.